Before proceeding to Dr. Schaeffer’s basic approach to apologetics one must understand the concept he calls “mannishness” or the tension of being a man. The idea is essentially that no man can live at ease in the area of despair. His significance, ability to love and be loved, and his capacity for rationality distinguish him from machines and animals and give evidence to this fact: Man is made in the image of God. Modern man has been forced to accept the false dichotomy between nature and grace and consequently, takes a leap of faith to the upper story and embraces some form of mysticism, which gives an illusion of unity to the whole. 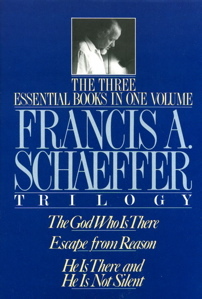 But as Schaeffer points out, “The very ‘mannishness’ of man refuses to live in the logic of the position to which his humanism and rationalism have brought him. To say that I am only a machine is one thing; to live consistently as if this were true is quite another” (The God Who Is There, 68). Schaeffer continues, “Every truly modern man is forced to accept some sort of leap in theory or practice, because the pressure of his own humanity demands it. He can say what he will concerning what he himself is; but no matter what he says he is, he is still a man” (The God Who Is There, 69).